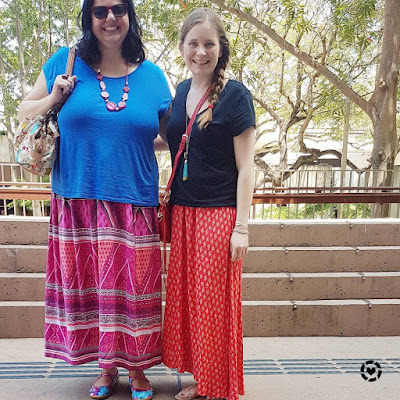 One of the things any Australian will know is that Kmart have these tiered strappy sundresses out in so many different prints. I got a cute black one, and resolved not to buy another, despite them seeming to have a new print every week. I was firm with my goal until I spotted a pink and blue one on the clearance rack, reduced from $15 to $2. So now I have two of these sundresses! 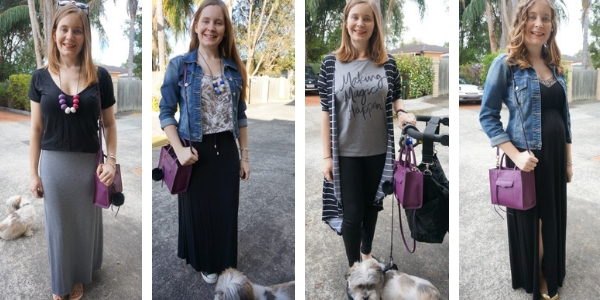 I'd like to say I'm content with these two, but they had multi coloured one reduced to $9 the other day I quite liked.... wearing the two I own below with another Kmart find, the silver glitter $8 sneakers! This outfit made me so happy. I love the way these dresses swing and they are so light and perfect for a hot day. 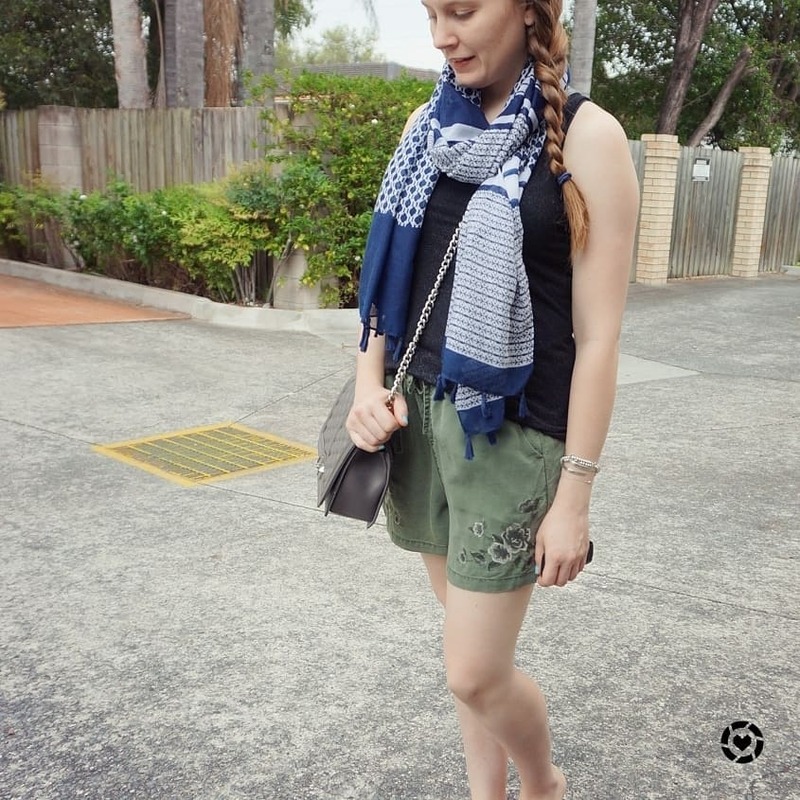 We had a quiet Sunday, our usual walk in the morning and then some time at home in the aircon before going over to my friends house for dinner and to watch Church Online together. This outfit just felt so like me! 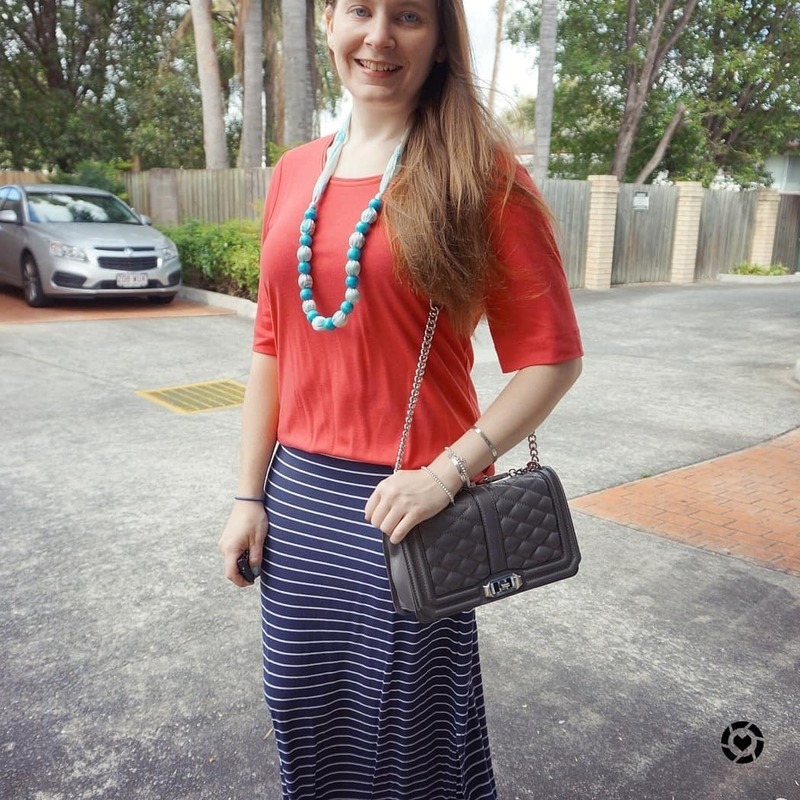 Not just because I like blue and pink together, but also because the pearl necklace was a gift, the dress was $2 and the shoes $8 and then I added a $240 Rebecca Minkoff bag to the $10 outfit 😂 Sums up my style perfectly, save on clothes, splurge on accessories! 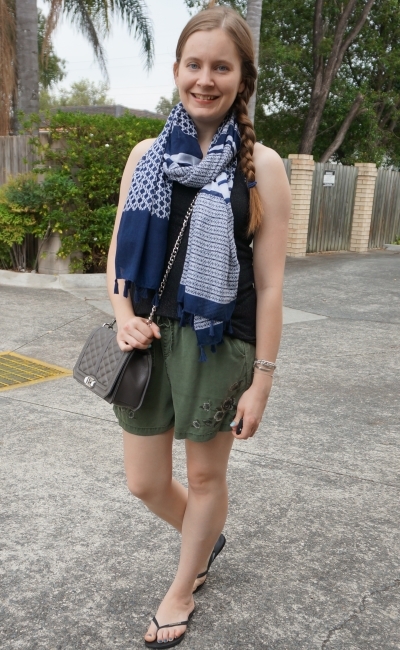 My shoes got a lot of admiration through the day, they are such a fun shoe to wear and so comfortable too. 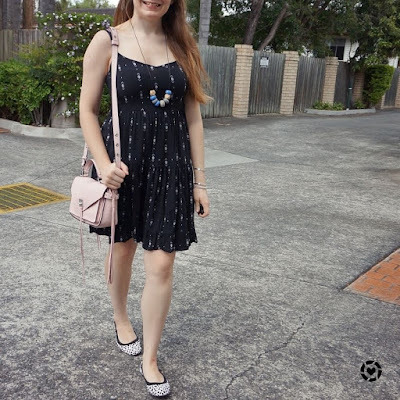 It was my first wearing of this dress, but given how well my peony pink Darren messenger bag matched the print, you are sure to see me wear the bag and dress together again in future! 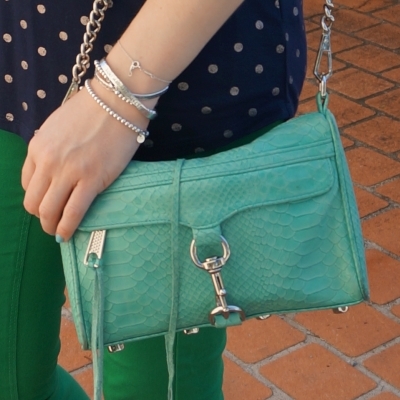 Last worn: pearl necklace, silver glitter sneakers, Rebecca Minkoff small Darren bag. 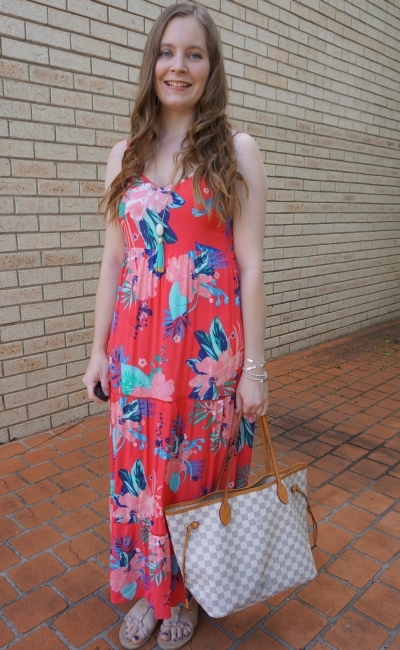 First time I've worn the dress on the blog as it is a recent purchase. Other ways to wear: silver glitter sneakers and jeans, Rebecca Minkoff small Darren bag in the office. 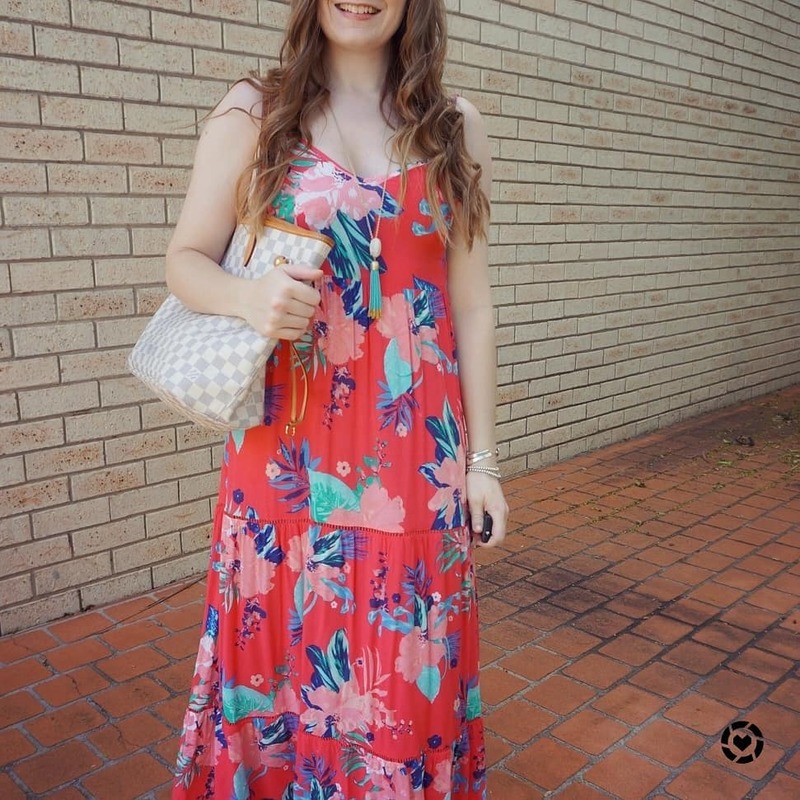 You might notice this dress fits a little differently from the blue and pink one above! This black one is my regular size so sits a bit higher and is a smidge shorter than the blue one above, which was a size larger and just $2, while I paid $15 full price for this one! 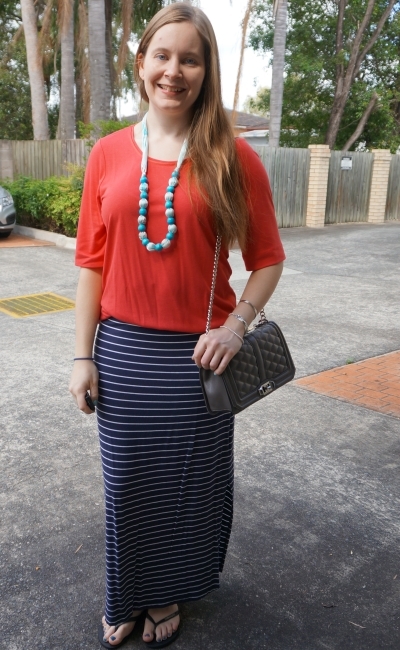 I do still love the length on this one, it's still really easy to wear around the boys. I wore this out for a morning at the library, a little time at the playground and then a few errands before going home for lunch. Since I loved the leopard print shoes with this dress last time, I paired them together again. 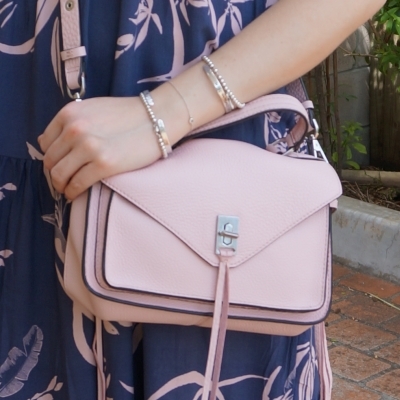 Again I stuck with the pastel pink Rebecca Minkoff Darren bag. While there was no pink in the print of this dress like the one above, I still felt the black dress and pastel pink bag worked nicely together. 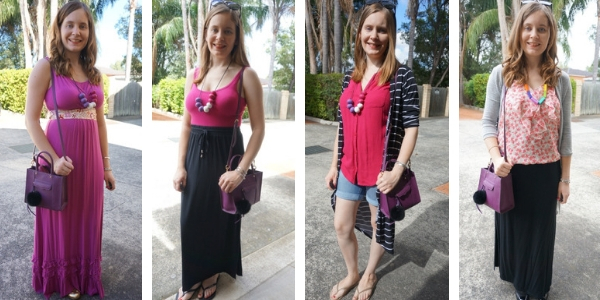 Plus, I'm a big fan of repeating outfit formulas when I like the results, and I loved the first outfit so much it made sense to recreate it with the same accessories and a different dress. 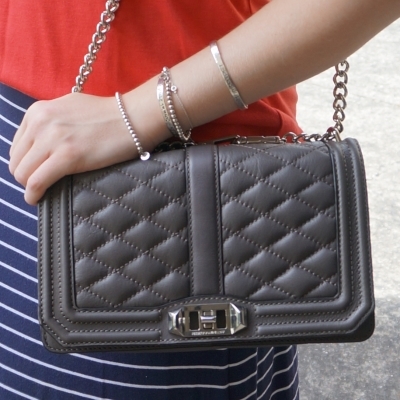 Last worn: black tiered dress, beaded necklace, leopard print flats, Rebecca Minkoff Darren bag (above). Other ways to wear: black tiered dress and ankle boots, leopard print flats with stripes, Rebecca Minkoff Darren bag and skinny jeans. 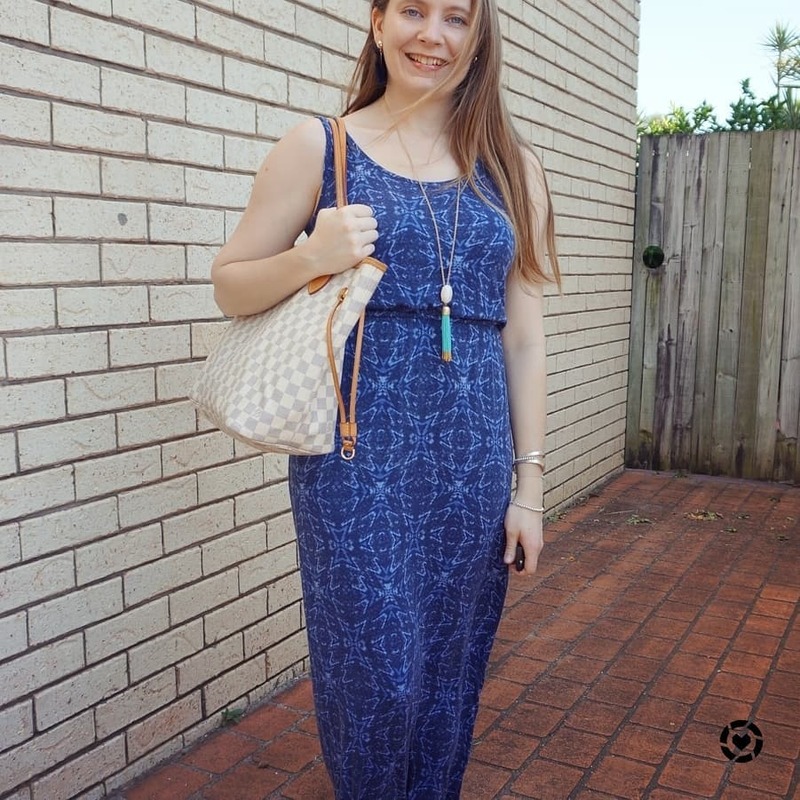 A strappy sundress is a summer staple, especially with the current Queensland heat and humidity. 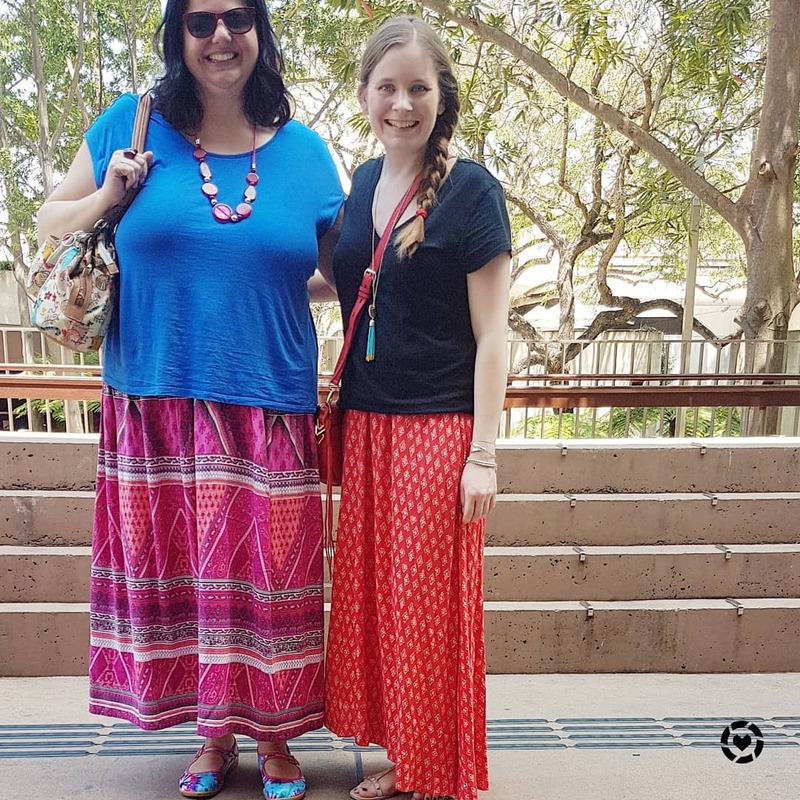 It makes it easy to justify having the same dress in different prints when the dresses are as light and floaty as theses. 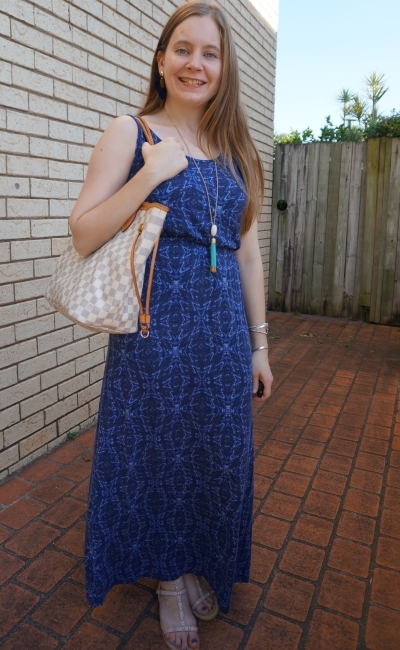 You can get a similar look with a tiered sundress made from viscose. 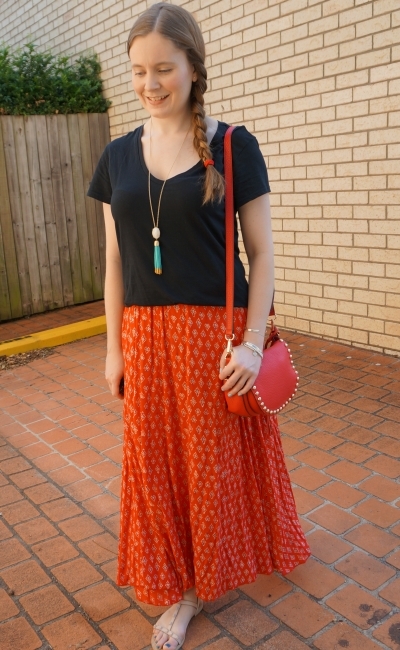 Add a fun cross body bag and you have a simple outfit that will keep you cool. Linking up with Fashion Files, Fabulous Friday, Friday Faves, Fancy Friday. I couldn't resist snapping up this little purple mini MAB tote bag in a Shopbop sale 3 years ago. 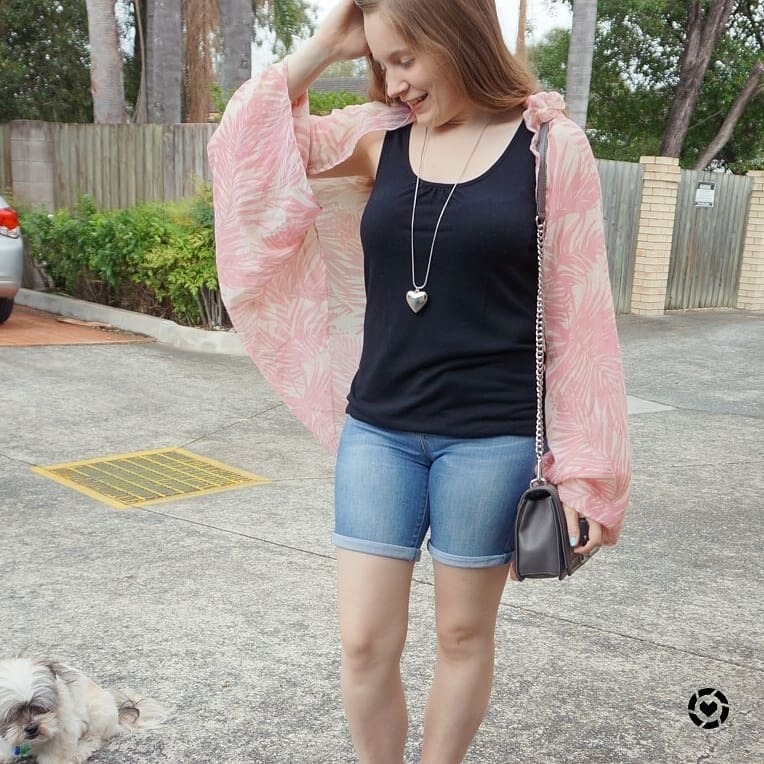 It's been a great addition to my wardrobe over the years, and today I'm celebrating it by making it the star of this month's 30 ways to wear post. Each month I take something from my wardrobe I've worn 30 times or more and make a roundup post showing the different ways you can wear it. 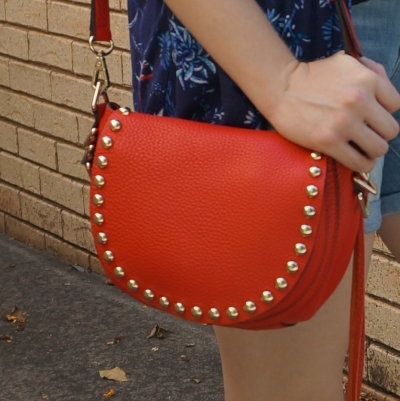 This bag was on sale for $146.25, although I don't recall if it was AUD or USD and the receipt doesn't tell me. Given that it's been worn over 50 times since then, it's getting good cost per wear! $2.71 per wear so far, and that will go down the longer I use the bag. It still looks new! It has a lot more wears to go to get the magic '$1 per wear' people aim for, but I know I will hit that with it eventually. I'm pleased with the cost per wear so far. 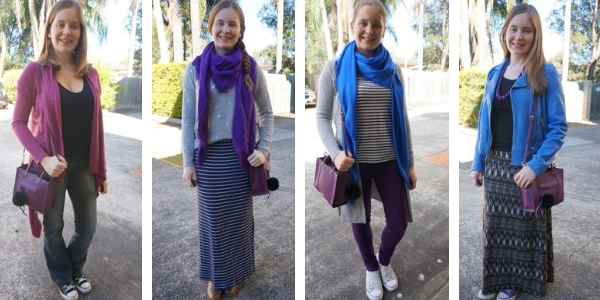 The easiest way to wear a purple bag - or any colourful bag! 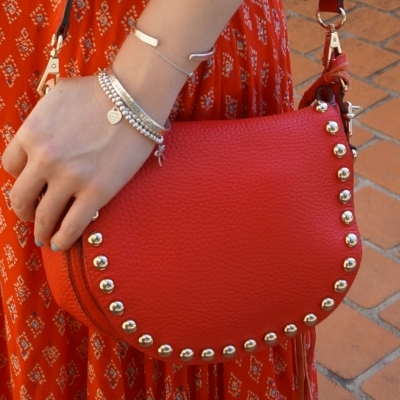 - is to keep your outfit neutral and let the bag be the pop of colour. 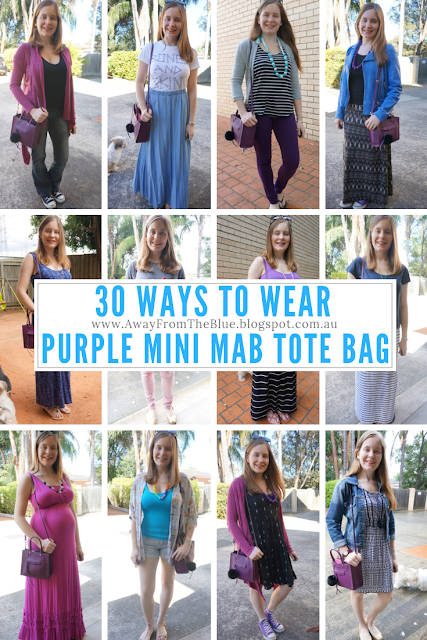 This plum purple mini MAB tote works so well with black and grey outfits. 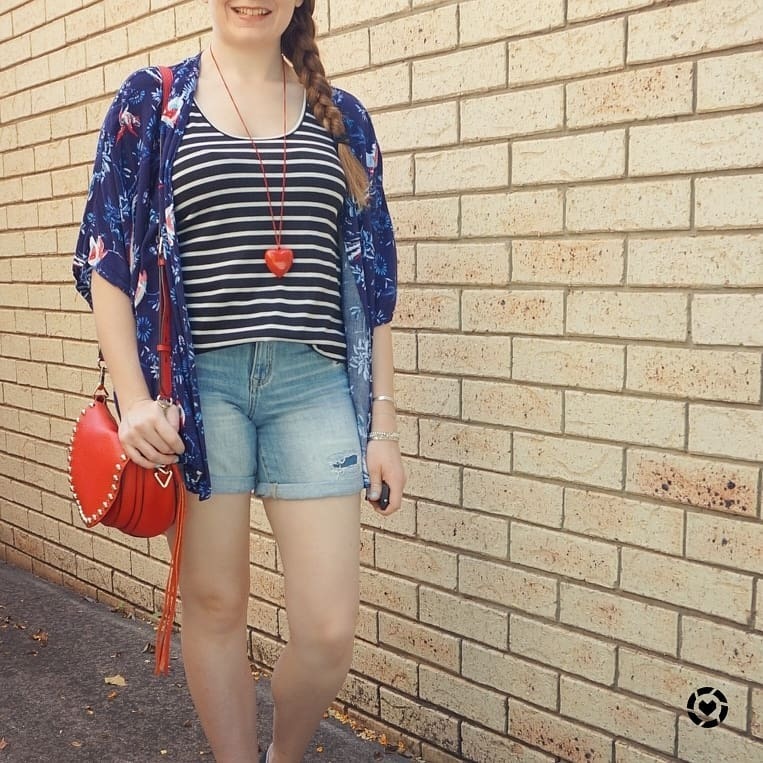 You can continue on the colourful theme with a necklace like I have in the first outfit, or just keep things simple and let the bag be the only bit of colour like I have in the other outfits. 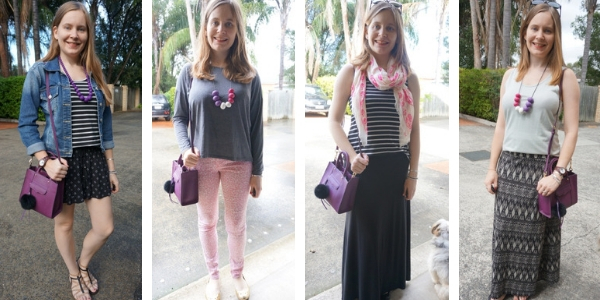 Pink and purple is a colour combination I love to wear together! You'll see it pop up in the other categories too. 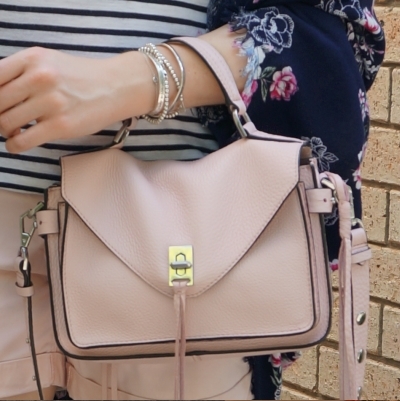 This purple bag works so nicely when wearing something pink in your outfit. 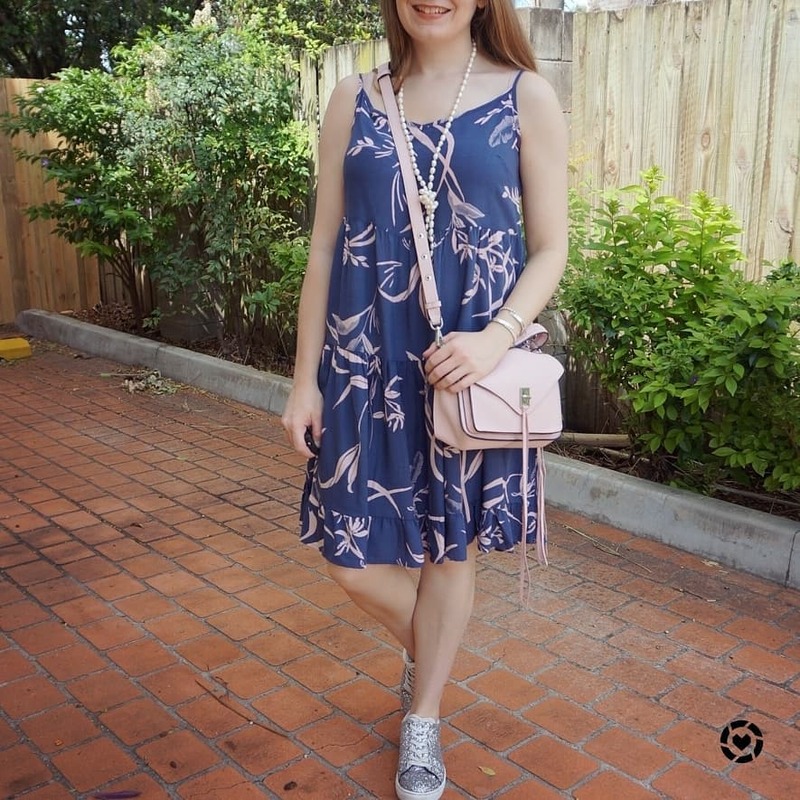 From head to toe pink in a maxi dress, berry pink tops, or a subtle pink printed cami, this purple bag is a wonderful accessory. 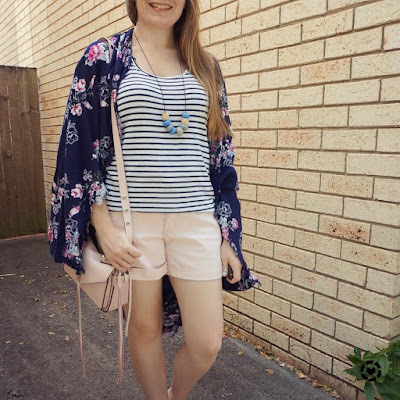 Blue and purple is another go-to colour combination for me, especially as I wear so much blue! Just like with the pink outfits above, this purple bag matches with head-to-toe blue in a maxi dress, or more subtle blues like a navy tee or a chambray maxi skirt. I will always love a big of matchy-matchy! Even if the shades are slightly different, I think this purple bag looks great worn with other purple pieces in an outfit to tie it all together. 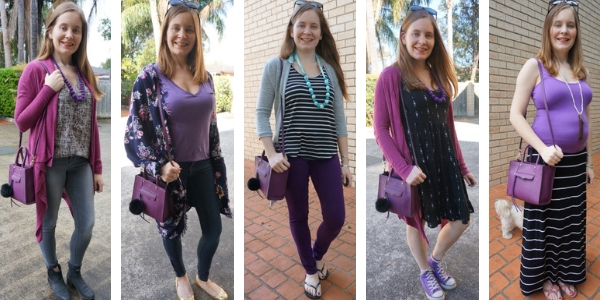 You could have a little touch of purple through a tee or tank, or a bolder mix with purple jeans or a purple cardigan - and matching purple accessories! 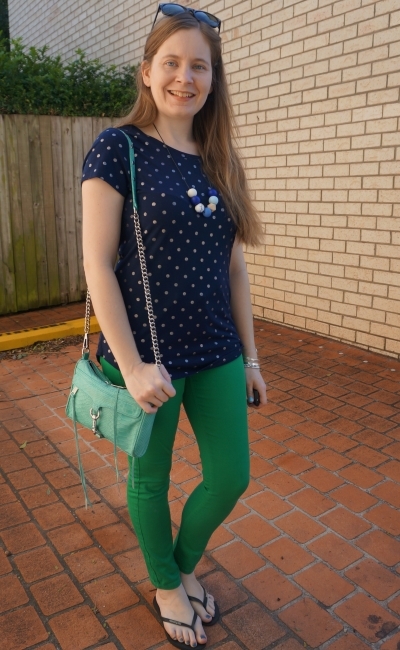 If you love a colour it makes sense to wear a lot of it in one outfit! 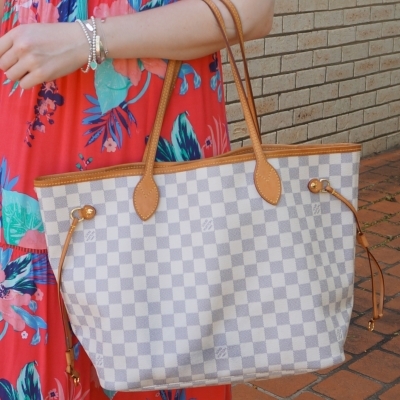 This cute little boxy tote is so simple to pair with a printed outfit. 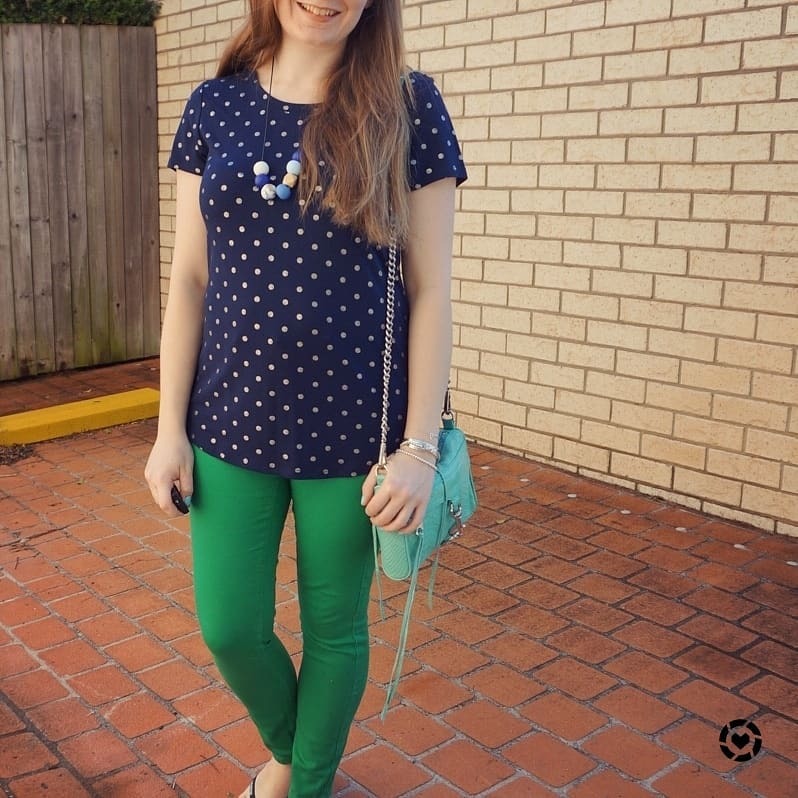 The plain, block colour means you don't have to worry about patterns clashing. 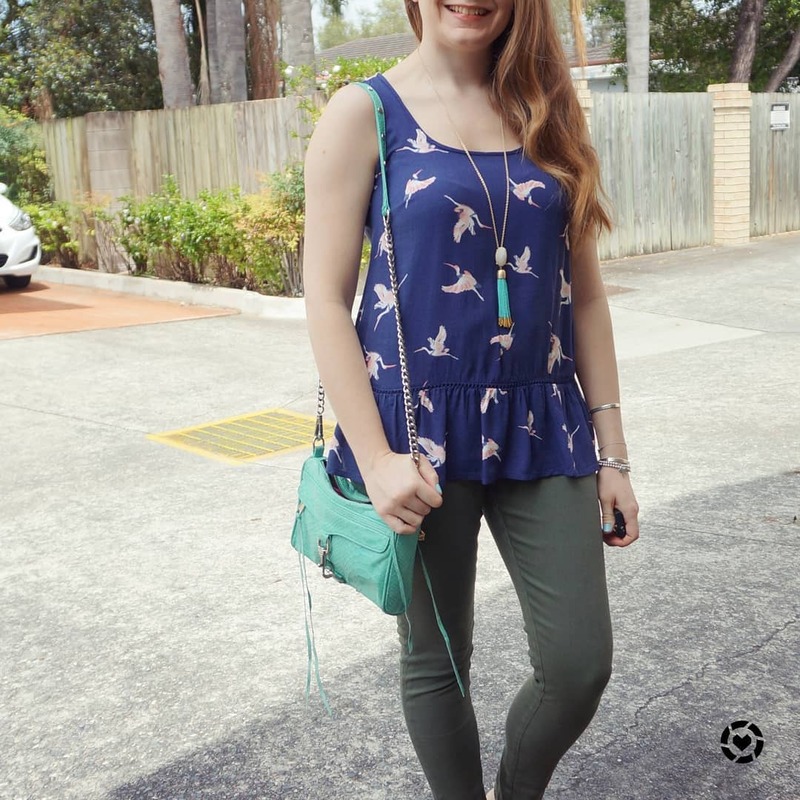 You can do a bit of print mixing like I have in the first outfit, or you can keep things simple and stick to one pattern piece. 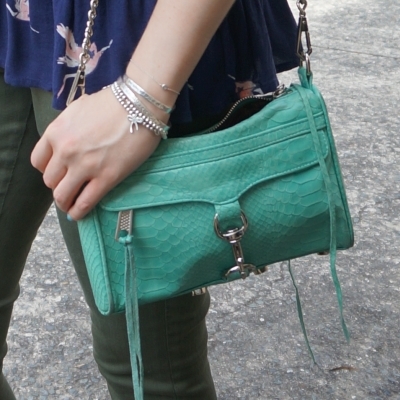 If you are trying to make the most of your wardrobe year round like I am, you'll find that bags can be worn in any season! 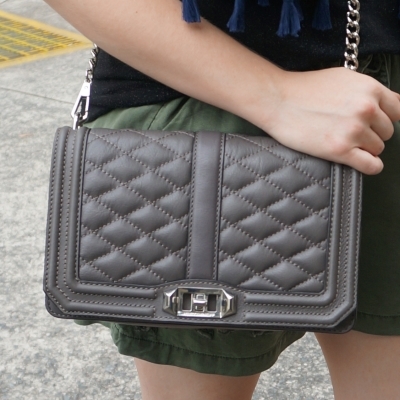 This plum purple bag was purchased in the Australian spring of 2015, which means it was an American autumn / winter bag. 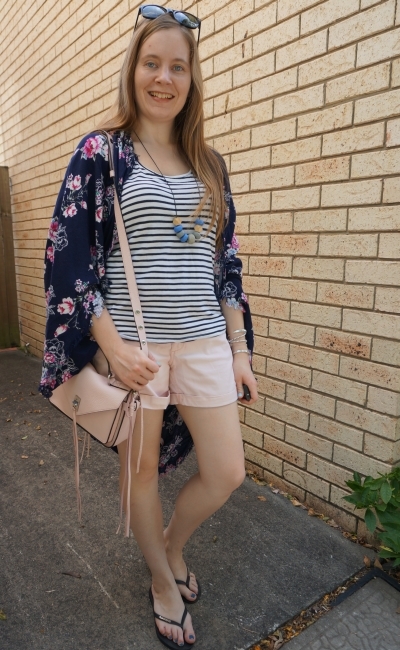 I've found the colour so easy to wear year round! 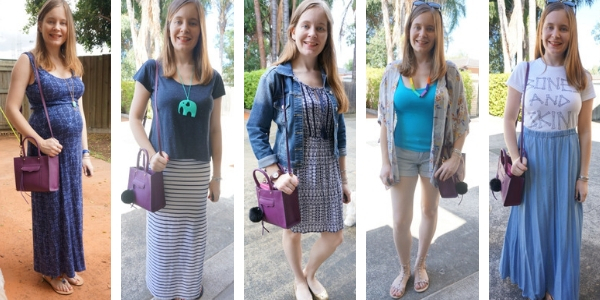 From simple summer shorts outfits to these layered winter ones, it really works in any season! One thing to note though is that the bag doesn't completely seal up, o maybe not a good idea on a snowy or wet day! 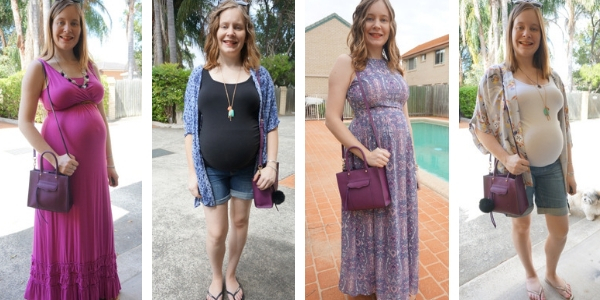 I do love closing out these 30 ways to wear posts with pregnancy photos, it's so nice looking back on the baby bump! 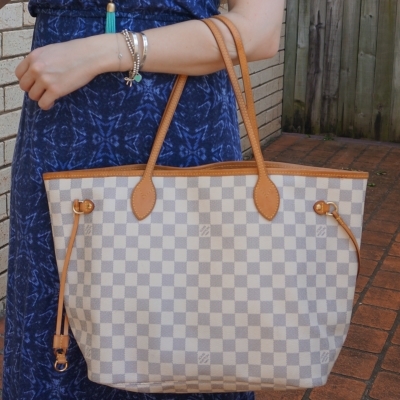 And it proves a very important point I bring up when buying bags - they are always going to fit and look good no matter what! This cute little purple MAB tote is the perfect example - it's holding its structured shape well and it's seen me through 3 years of wear with many more wears left in it! Linking up with Confident Twosday, Turning Heads, Trend Spin, Style Sessions, Style On The Daily, Oh Hey Girl, Fashion Frenzy, Chic and Stylish, Fashion Files.